A small but very lovely, personal Book of Hours made for Peter or Pierre Serainchamps that commemorates him and his wife. 105 x 80 mm. – 210 leaves, 17 illuminated initials, 10 full-page miniatures with full borders, each facing a large illuminated initial, all with full borders. With the arms of the patron and his emblem. The decoration of the manuscript at hand is highly personalised with the patron's arms (on three pages: d’argent à la bande de gueules, chargé de trois fleurs-de-néflier, de quatre feuilles d’or), with his device consisting of the initial S around two crossed scabbards and the motto “druc”, and with the initials P and I joined by a love knot. The donor is shown kneeling in the border before the image of St. Peter (f. 159v). In the accompanying prayer, the text refers to "ego miser peccator" (I poor sinner). The patron must have been a member of the Serainchamps family of the Liège region: presumably Pierre Serainchamps (of Seraing-le-Château Castle?) who was possibly married to the (unknown) lady J (Jeanne?). 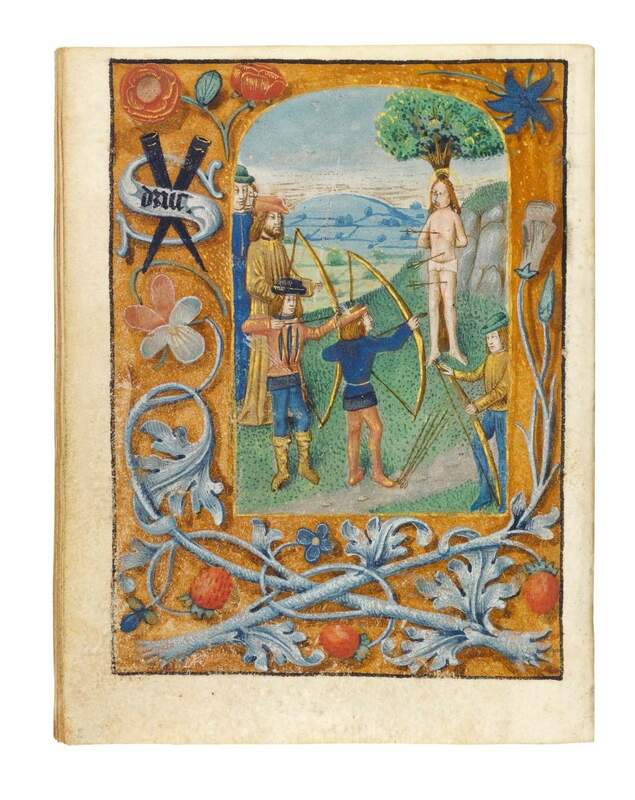 The charming miniatures and facing pages with lush borders are the work of the chief illuminator of the Masters of Adolph of Cleves, named for the Book of Hours of Adolph of Cleves and La Marck (Baltimore, Walters Art Gallery, ms. W. 439), which was produced in Ghent in the 1480s for the great bibliophile Adolph, Duke of Cleves and Lord of Ravenstein (1425-1492), son of Adolph II of Cleves and Mary of Burgundy (1393-1463), sister of Philip the Good. This atelier's style draws on the miniatures and border designs of the Master of the Older Prayer book of Maximilian and shows the influence of the Master of Mary of Burgundy. The workshop was thus responsible for quite important commissions. Date and localisation seem to refer to Ghent, c. 1480-1485. The present Book of Hours – this workshop's only manuscript known to be entirely the work of one illuminator – bears close similarities with the Hours of Adolph of Cleves itself, notably in the composition opening the Office of the Virgin, showing the Virgo lactans in a window. This illuminator's style is characterised by spacious interiors and expansive landscapes, although, on these small format pages, without intricate details and with the accommodation of somewhat stiff, but vigorous figures. The border decoration in the Hours of Adolph of Cleves, with trellises and even monkeys, also reappear in the present book. Most interesting is the iconography of the Virgo Lactans and the Virgin, as Mother of Mercy, showing her breasts at the Last Judgement and thus emphasizing Mary’s intercessory role: "Maria ostendit filio suo pectus et ubera" known from the Speculum Humanae Salvationis and French miracle plays. The theme is also used in Books of Hours where, however, Mary’s role as mediatrix may appear in various settings, as is illustrated in the famous Turin Milan Hours by Van Eyck and in the Hours of Catherine of Cleves, where twice she accompanies Christ on the Cross.